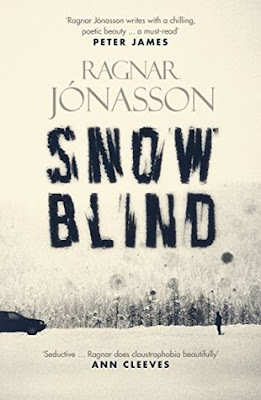 Snowblind is the first in a series of novels, labelled as 'Dark Iceland'. Read the first page and you will immediately understand why - it is dark, it is gripping and it is fascinating. Snowblind is a novel about what happens in a small community where everyone knows everyone and nothing ever happens. Nothing ever happens - those three words are supposed to make our main protagonist Ari Thor feel welcome when he arrives alone in Siglufjorour and Tomas his senior colleague in the local Police force tells him he doesn't need to lock his door. Ari Thor does anyway. Feeling completely alone in this isolated, claustrophobic and judgemental community, Ari feels anything but safe. When an elderly novelist, a local celebrity is found dead in suspicious circumstances, Ari is quick to voice his suspicions, eager to investigate and make a good impression on his new boss. Unfortunately his opinions are unwelcome and Tomas is quick to shoot him down insisting that the death was an accident. Ari stays quiet but continues to investigate without his superiors knowledge convinced that the old man was murdered. Circumstances change rapidly when a woman is found in the snow, blood all around her. Siglufjorour is not so dull after all! Ari suspects the two 'incidents' could be connected - he just doesn't know who or what connects them. As he continues his investigations, this time with Tomas' help, he begins to uncover a deep web of secrets and lies, and it seems that no one in Siglufjour is exactly who they claim to be. Snowblind is available to buy now from Amazon online. A huge thank you to the Book Club on Facebook and Orenda books for my copy of the novel.